Milkweed Species For Your Garden! HomeBlogEveryday EcologyMilkweed Species For Your Garden! These beautiful, lovely smelling plants are the hosts for monarch caterpillars, which can eat nothing but milkweed leaves and young seed pods. 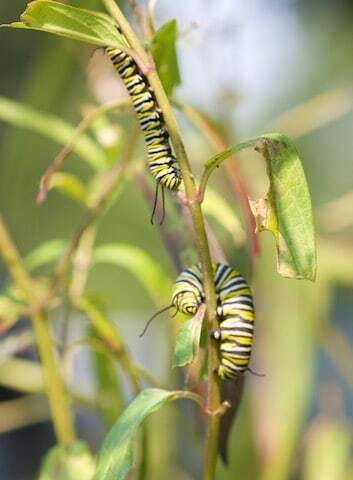 Adult monarchs lay their eggs under milkweed leaves, and the caterpillars hatch and eat almost non-stop until they’re big enough to transform into butterflies. Milkweeds contain chemical compounds that make the caterpillars taste terrible to birds, which learn not to eat them. 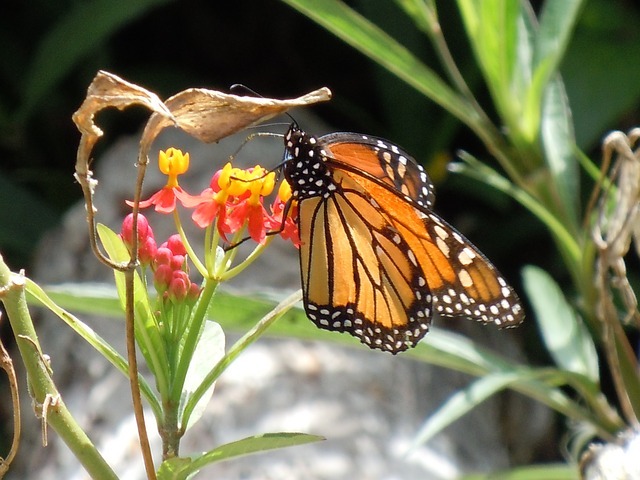 Without milkweeds, there would be no monarch butterflies. 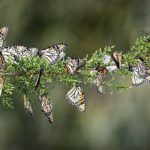 Monarch populations have declined because of habitat loss and catestrophic cold events that occur periodically in the Oyamel fir forests they winter in in Mexico. 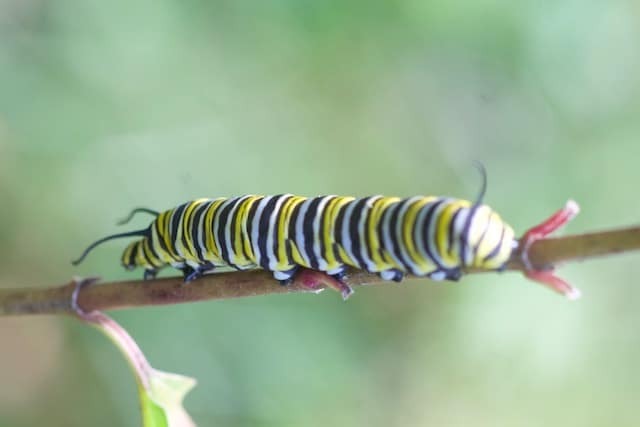 Planting milkweed not only helps monarchs, it gives you the opportunity to watch the magical process of caterpillars transforming into butterflies! 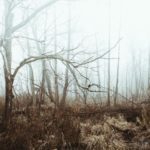 This post discusses milkweed species that thrive in the Midwest and Northeast, and how to plant them. 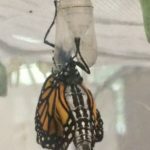 Monarchwatch.org has a good guide on which milkweed species grow best in other geographic regions, and they also have information on how to start milkweed plants indoors from seed. 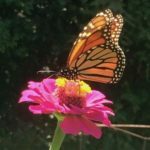 So read on to learn how to help monarchs while beautifying your yard! A tall perennial (3 to 8 feet) with big leaves and big seed pods, common milkweed is native to the US east of Colorado and to southern and eastern Canada. It grows in disturbed areas, such as old fields, roadsides and ditches. 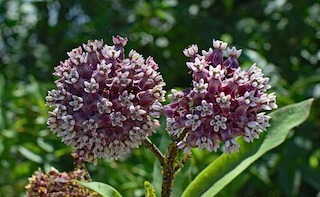 Common milkweed flowers in early to mid summer. The pods open in September and October, releasing clusters of seeds on silks. Common milkweed spreads by seed and rhizomes (horizontally growing underground stems that sprout roots and shoots). Plant common milkweed seeds outside in the fall or winter, in areas where the plants will get direct sunlight for at least part of the day. Plant seeds no more than 1/4-inch deep. Milkweed seeds need to be cold-stratified, meaning they need to be exposed to cold in order to germinate later when the soils warm up. You can plant the seeds in spring if you have cold-stratified them yourself in the refrigerator. Seedlings should be watered periodically until the plants are established. You can also propagate common milkweed from segments of rhizomes of mature plants that have gone dormant (late fall). To do this, find an area with plenty of milkweed. After the plants have gone dormant, dig one up and separate segments of rhizomes. Make sure each segment contains a little white bud, and plant these in areas where they will receive full sun. Common milkweed can grow in a variety of soil types, from medium to well-drained, sandy to clayey and rocky. Swamp milkweed is native to most of the continental US and eastern Canada. 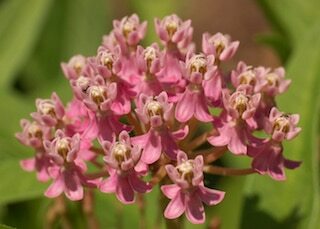 This perennial grows up to about 5 feet tall and has pink to purple flowers and thinner leaves than common milkweed. As the name suggests, swamp milkweed grows well in soils that are moist or wet during part of the growing season, such as marshes, swamps, floodplains, rain gardens and swales. It will even grow in well-drained areas with good soils, but it is not as competitive in drier areas and may be edged out by other plants. It does well in full sun to part shade and can tolerate heavy clay soils. 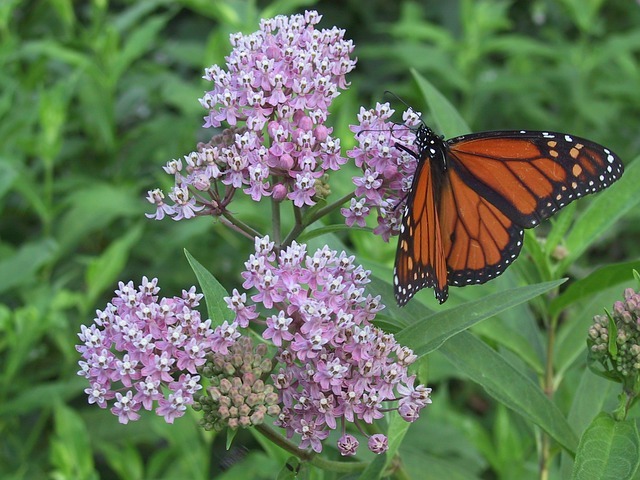 Swamp milkweed attracts hummingbirds and many other butterflies in addition to monarchs. It also attracts aphids, which other insects and birds will eat. Swamp milkweed spreads by seed and by rhizomes. Sow seeds shallowly in soil (max 1/4-inch deep) in fall or winter. You can plant plugs (young plants) in spring. You can also divide mature plants in late spring to share with friends and neighbors or to increase your planting area. To divide plants, separate the root clumps, making sure each clump contains at least one stem. Transplant immediately to the new area. Butterflyweed is native to most of the lower 48 and eastern Canada. 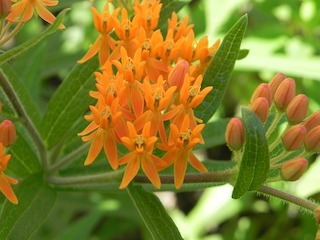 This is a shorter (around 2 feet) milkweed with showy orange flowers and dark green, lance-shaped leaves. It needs full sun and well-drained soils. Butterflyweed blooms in spring and summer and will tolerate drought because it establishes a taproot. It is found on roadsides, in old fields, prairies and other areas with well-drained soils and plenty of sun. Seeds of butterfly milkweed can be sown directly in soil in fall. Or, you can cold-stratify the seeds for 3 months and then plant them in the spring. 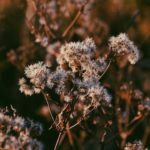 According to wildflower.org, you can propagate butterfly weed in the fall by cutting the taproot into 2-inch sections and planting the sections vertically in the soil. Keep soil moist until seedlings are established. Whorled milkweed is a short plant (1 to 2 feet tall) that grows in dry to mesic (medium moisture), well-drained soils and in full sun to light shade. It is native to much of the US and Canada and is found in dry prairies, roadsides, pastures, disturbed soils, dry open woods and fields. The leaves of whorled milkweed are very narrow and arranged in a whorl around the stem. 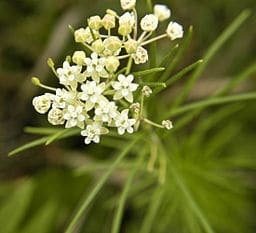 Its white flowers open in mid-summer, which makes it a nice complement to milkweeds that flower earlier, and the seedpods are long and narrow. 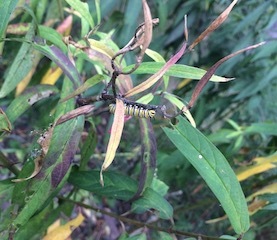 According to monarchwatch.org, this species senesces (dies back) later in the year, which makes it an important food source for late-summer monarch caterpillars. Whorled milkweed spreads by seeds and rhizomes. To grow whorled milkweed, plant seeds in the fall, or plant plugs in fall or spring. if you have the space and soil/sun conditions. 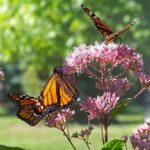 Between the species discussed here, you can establish a great milkweed and monarch habitat whether you have a little or a lot of sun, and dry, medium or wet, sandy, rocky or clayey soils! Try to plant in clusters to ensure there will be plenty of leaves to feed hungry caterpillars!